In the cold, muscles take longer to warm up and so you may be more prone to injury when practising winter sports such as skiing and snowboarding. Your feet and ankles are particularly important in skiing, as they act as shock absorbers and brakes, as well as helping you to steer and accelerate when whizzing down the slopes and so must be as protected as possible. Any pre-existing conditions or injuries can not only compromise your performance but also leave you open to further damage to the area.However, these risks can be minimised with the right equipment and training. These are the most common problems faced by skiers, and can be mainly avoided with quality equipment and good fitting ski boots. Not everyone’s feet are the same and thickened joints in the foot and ankle will be prone to bruising and friction which lead to blisters. 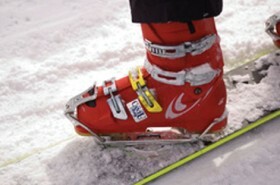 The ankle bone, toes, top of the foot and front of the shin are easily rubbed by even the best-fitting ski boot, and any moisture held against the foot will cause friction and quickly lead to blisters. While these sound like very minor problems,bumps and blisters can keep you off the slopes while they heal and eat into your precious holiday time. Do not pop a blister, but if it breaks on its own, apply an antiseptic and cover with a sterile dressing. If you know you are prone to blistering in a particular area, some skiers advise applying Vaseline to the area before starting to ski as a preventative measure. Ski boots and the physical exertion of winter sports can exacerbate any pre-existing foot problems, such as bunions, and bony prominences on the outside of the foot which are prone to rubbing and blistering if your boot is not well-fitted. Other conditions, such as diabetes or Raynauds Syndrome which both affect circulation are made worse by cold and tight-fitting footwear which have to be carefully monitored when skiing. Chilblains are itchy blisters that can pop up in cold conditions usually on the toes but also on fingers and even on the face. Again, keeping these areas warm and dry is the best way to prevent them. For those people that wear Orthotics we recommend that you remove any arch support that has been fitted to your boots and replace them with your Orthotic devices which will fit snugly into your boots.